Philadelphia, PA – In a surprise move, the defense in the Kermit Gosnell murder trial has rested without calling a single witness. The news comes on the heals of a clarification by Judge Jeffery P. Minehart about a mix-up in the dismissal of one of the murder charges yesterday. Yesterday’s dismissal of nine criminal charges against accused murderer Kermit Gosnell stunned many who have followed this macabre case involving babies born alive during illegal late-term abortions then intentionally killed amid squalid conditions at Gosnell’s “House of Horrors” abortion clinic. Today, Judge Jeffery P. Minehart clarified that he did not intend to drop the First Degree Murder charges for Baby C, a baby witnesses said was breathing for 20 minutes before it was stabbed in the neck by Lynda Williams in Gosnell’s presence. Instead, murder charges should have been dismissed in the death of Baby F for which there was less compelling evidence. Nevertheless, the dismissals are expected to have little effect on the trial’s outcome. Court records show that Gosnell still faces over 380 criminal counts, including five murder charges. A conviction on any of the First Degree murder counts would mean he could still receive the death penalty or life in prison without parole. •	Three counts of First Degree Murder in the deaths of Babies Boy B, Baby G, and Baby F (after correction by the judge). •	Five counts of Abuse of Corpse related to the discovery of five jars containing the severed feet of large aborted babies. However, according to court records, Conspiracy and Solicitation to Commit Murder charges for Baby C remain active and were not dismissed with the murder charges. Also dismissed were were six counts of “Theft by Deception” against former Gosnell employee Eileen O’Neill, who is standing trail with Gosnell. She is accused of billing for medical services provided as she was masquerading as a license physician. Three remaining counts will go to the jury. 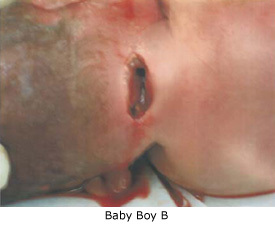 Baby Boy B was discovered during the original 2010 law enforcement raid of Gosnell’s abortion clinic frozen in a red biohazard bag along with the remains of 46 other aborted babies. The medical examiner told the grand jury that he estimated gestational age of Baby Boy B to be 28 weeks. This baby was intact and bore the now-familiar neck wound that indicated his spinal cord had been severed. However, there was no testimony presented during the trial that this baby ever moved or breathed. Gosnell had been charged with infanticide related to the death of Baby Boy B. Baby G was of an unknown gestational age. An unlicensed abortionist who worked with Gosnell testified before the Grand Jury that he helped Gosnell deliver Baby G and observed a “respiratory excursion,” or a breath. He said Gosnell then turned the baby over and severed his spinal cord with scissors. Baby F was estimated to be 25-27 weeks gestation when Steven Massof, an unlicensed abortionist employed by Gosnell, assisted his boss in the abortion and delivery of the intact baby. Massof testified that he saw a leg “jerk and move” after which he saw Gosnell sever its spine. The five Abuse of Corpse charges dismissed by Judge Minehart related to five jars of severed feet seized from Gosnell’s clinic. McMahon argued that they were kept for possible DNA sampling and as proof of gestational age, but medical professionals who testified all said that there was no known medical reason or precedent for such behavior. While those charges have been dropped, it is estimated that over 380 other criminal charges remain, including four counts of First Degree Murder for the deaths of Baby Boy A, Baby C, Baby D, and Baby E and one count of Third Degree Murder for the death of patient Karnamaya Mongar. Baby Boy A was the biggest baby that Kareema Cross had ever seen delivered at Gosnell’s abortion “House of Horrors” clinic in the four years she worked there. He was delivered to 17-year old Shaquana Abrams at 29.4 weeks gestation, according to an ultrasound record. Baby Boy A was so large, he did not fit into the plastic shoe box that Gosnell tossed him in. Cross said she saw the baby pull in his arms and legs while Gosnell explained the movements as “reflexes” telling her the baby really didn’t move prior to cutting the baby’s neck. Baby Boy A was so large, Gosnell joked that “this baby is big enough to walk around with me or walk me to the bus stop.” Cross and fellow employees Adrienne Moton and 15-year old Ashley Baldwin were all so “startled” by the size of the baby that they all took photos of the baby with their cell phones. Baby C was an intact baby of over 25-weeks gestation. Kareema Cross testified that she saw Baby C breathing and described the up and down chest movements she observed for 20 minutes. She told the court she saw Lynda Williams lift the baby’s arm and watched as the newborn drew it back on its own power. Afterwards, Williams inserted surgical scissors into the baby’s neck and “snipped” the spinal cord. Gosnell was said to be in the room at the time. This baby’s murder charges were unintentionally dismissed in the place of Baby F, but were reinstated after Judge Minehart discovered his error. Baby D was described by witnesses as 12-15 inches long with the head the size of a “big pancake” when he was delivered into a toilet. Kareema Cross testified that she saw the baby struggling, using swimming motions in an attempt to get out of the toilet bowl. Adrienne Moton pulled the baby out and “snipped” the neck, as Gosnell had taught her to do, while the mother watched. Gosnell has also been charged with Criminal Solicitation of Moton to commit murder of Baby D.
Baldwin said that Gosnell when into the room then came out with the baby — which now had an incision in its neck — and tossed it into the waste bin. Gosnell also still faces one Third Degree Murder charge in the drug overdose death of second-trimester abortion patient Karnamaya Mongar. Witnesses testified that Mongar was not breathing right but Gosnell completed the abortion before attempting to revive Mongar. A defibrillator present in the room at the time was broken and unusable. Gosnell also faces several other charges related to the death of Mongar, including Murder by Drug Delivery Resulting in Death. Gosnell faces a massive amount of other charges related to his corrupt abortion organization, including several violations of the Controlled Substances act for sloppy or improper drug handling and administration by unqualified employees. He also faces numerous Conspiracy and Solicitation charges related to the murder of newborns and illegal distribution of drugs. Gosnell faces a whopping 310 counts of violating Informed Consent laws, 33 counts of abortion at more than 24 weeks, and 10 counts of Theft by Deception, and three counts of Corruption of a Minor. He is also facing charges of running a Corrupt Organization and Racketeering. Gosnell also faces numerous Federal drug charges for the illegal distribution of narcotics that ended up on the streets of Philadelphia. He is expected to be tried in that case sometime later in Federal Court. Operation Rescue plans to be in the courtroom for closing arguments.